Nater Tot: You know how I said I wasn't into making cutesy kid food? 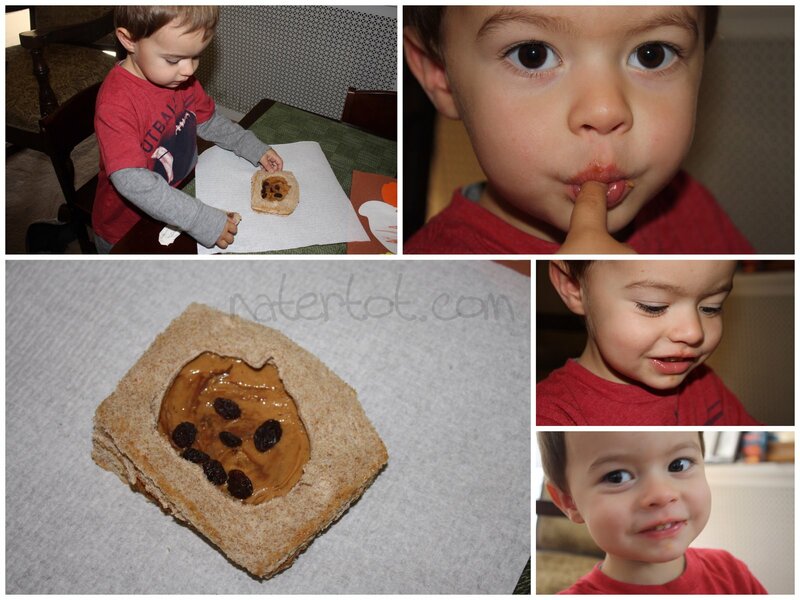 You know how I said I wasn't into making cutesy kid food? I lied. I really should have said that I do like it, I'm just not very good at it. See this sandwich below? It is supposed to be a jack-o-lantern. I'm not fishing (or phishing) for compliments, so don't bother telling me it looks good. I'm not losing sleep over it. I'm just saying. It's kind of ugly. Also, see how it looks sort of dark brown? There's nothing wrong with the peanut butter. Nate wanted some Nutella on it and we were just about out, so I smeared a Nutella crumb on there for him. Anyway, Nate was pleased, which was the whole point. And the endless peanut butter sandwich parade in our house is getting pretty boring, so it made me happy to mix it up. I think I did a little better with the ghost sandwich today. Nate liked it so much he demanded politely requested another. How about you? Are you doing anything ridiculous creative with your food?